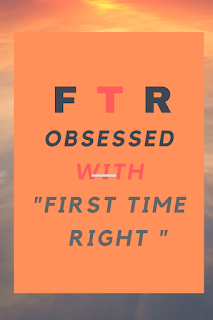 The Dove's Corner: Are we obsessed with being First Time Right ! 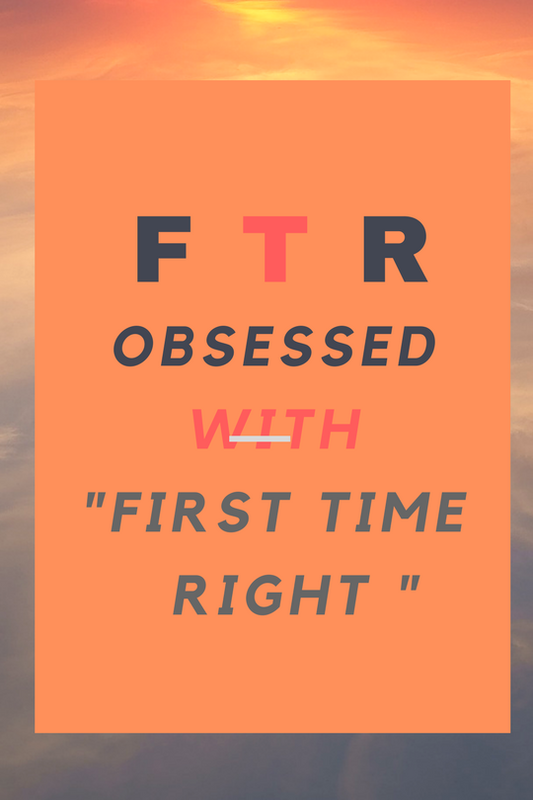 Are we obsessed with being First Time Right ! Branch Banking , of a leading Indian Bank , we were engaged in a serious chat , trying to design a training and coaching initiative , which could possibly help the Sales Teams tame this bug which was popularly being termed as 100% FTR (First Time Right ), or in simple language achieving zero errors, the very first time ,while logging in complete and correctly filled application forms from customers for all products , be it for Bank Account Opening , Credit Cards, etc. Closer to mid year review, the time for the final reckoning for all the sales teams was approaching.. Graphs and pie charts of all shapes, shades and hues to pin the contenders as per their performance were ruling the slide show , that he was simultaneously perusing on his laptop screen. He began sharing with me ,data pertaining to this new bug which was hovering here and there in everyone’s report card and though not even remotely connected to actual sales figures, had in fact turned out to be the game changer in deciding the final winner – I could understand the cause of his panic, the figures were pretty dismal .. And as per their findings, the process of extracting relevant data from the forms by the operations team who finally generated functional accounts , was turning out to be increasingly tedious and overtly delayed, largely traced to incomplete and incorrectly filled forms that were sourced by the sales teams, not only costing time lags and increased costs ,but increasing cases of customer dissatisfaction too ! And hence the weight of this KRA in tracking the performance of Sales Managers was all too high now ! This in spite the fact that the application forms are being sourced and reviewed by Sales Officers and Managers who are very often graduates and post graduates in their respective discipline and there’s nothing seemingly complicated in the task of submitting error free forms. A symptom being witnessed not only in Banking but in certain other sectors of the service industry, too, I bet ! While this shall be addressed and eventually effective processes rolled out …, my mind wanders to the root cause and the question of our obsession with FTR in not one but in so many areas of our lives , and what could possibly be the reason behind ultimately not achieving it as desired and as cited in the above case ! Yes, technically terms like FTR or getting it right the first time, signify error free processes and products and speak volumes of efficiency and effectiveness in any business and are an essential pre-requisite for great customer experience ! No question of any bargains there at all…the benchmark of quality is getting it right the first time ! However isn’t it also time to reflect whether being Right the First time has been kind of over rated when it comes to all other aspects of our existence, and is it time we allow some room for making mistakes and errors too, and improving at a reasonable pace..? I am prompted to straight go down to our childhood days- the infatuation with FTR looms large from very early years ..
No infant possibly stands up and starts walking one fine day without being preceded by stages of falling and getting hurt and crying and calling for some attention from his caregivers, but here too, if there could possibly have been a case of getting it right the first time, I can say without a doubt, that such a child would prove to be a favourite of his parents ! Does it mean that we as a culture have collectively moved away from encouraging mistakes and gradual improvement by doing and experiencing ,which could have ultimately led to better understanding and more effective results ? Going back again to our schooling and growing up years, we have always noticed heaps of appreciation being doled out to the quick learners who seem to be naturals and born with their gifts - be it mastering the art of cycling at the very first stroke on the pedal or doing quick math or humming the perfect tune of the classical raga or staying afloat at the very first dip in the swimming pool or making the perfect rounded chapati at the first try, etc..
We have all witnessed at least sometime, these naturally gifteds and the First Time Rights in every field who managed to garner applause and adulation from all and sundry! And being early bloomers further keeps adding to their advantage in many ways , helping them build more self confidence and ultimately the accumulative advantage spilling over to all other areas in life. The winner has it all, as they say ! But the fact remains, that some of them if not all, eventually lose out in learning to also excel or pickup skills in areas where they are not naturals.. They may never get to realize the due that persistent efforts and an eye for details - needs to be given ; or what we term - developing the growth mindset- is what they end up lacking! They too stand to win laurels but not so readily , isn’t it ? The impatience with a prolonged learning time being taken by some students, many a time prods parents and educators to almost give up on them halfway as incapable and this leaves them with a feeling of being a loser , harboring low self esteem, and almost terror struck with the fear of making mistakes ! They rarely manage to win the attention and appreciation of their mentors easily, and most often have to stand up for themselves.. , but those who ultimately do – prove to be the ones who look at processes from close quarters and having done things first hand , stand to understand better and deliver more effectively when it comes to on-the-job situations like the ones discussed in the Sales team’s FTR numbers cited above. So what is it so attractive about doing things right the very first time and why are we so obsessed with raising generations after generations driven by fixed mindset and scared of failing even once..
creativity, and need to be taken in the right spirit ! But the unending craze in youngsters’ and educators’ minds to always have it FTR with their talents and gifts..rather than directing efforts towards gradual and continuous improvement is what leads to this stage when post graduate degrees too fail in helping them getting ATR , or Anytime Right , the basics - case in mind - checking correctness of application forms ! Students and children want easy answers and teachers and mentors want techniques that work right the first time; and both share the fear of failure. Zero defects has become a way of thinking and doing, that reinforces the notion that errors are not acceptable. The idea here is that with this philosophy, one can increase happiness by eliminating the frustration of failure . Thankyou for reading my post and I look forward to your comments. Namita is an Internationally Certified Success Coach, Career Counselor and Life Coach with ICF credentials . (International Coach Federation). She is also a Behavioural Trainer, Sales Trainer, Writer and Speaker on a mission to help everyone unlock their infinite potential and build an extraordinary purposeful life.